The following is a guide to the differences between the Web Degree Audit and the Official Degree Report Printout. According to the symbol on the left, the entire requirement is currently in progress (the yellow symbol). 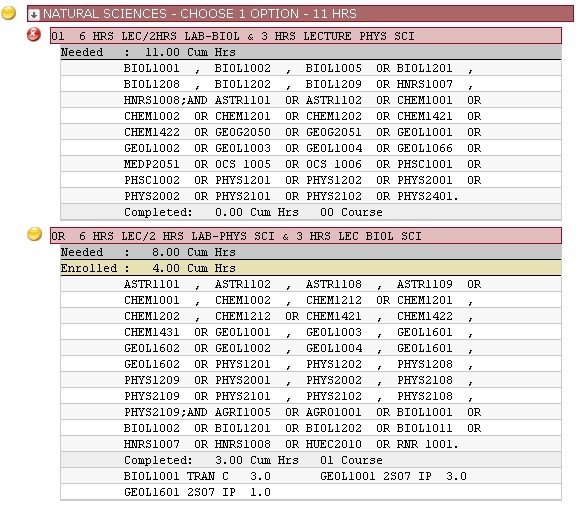 Within the natural sciences requirement, there are two sub-requirement selections, one shown as incomplete (the red symbol), and one shown as currently in progress (the yellow symbol). The first sub-requirement selection is shown as incomplete because the degree audit automatically assumes that the second subrequirement path has been chosen, based on the classes the student has or is currently taking. The colored bars also play a role in the example below. 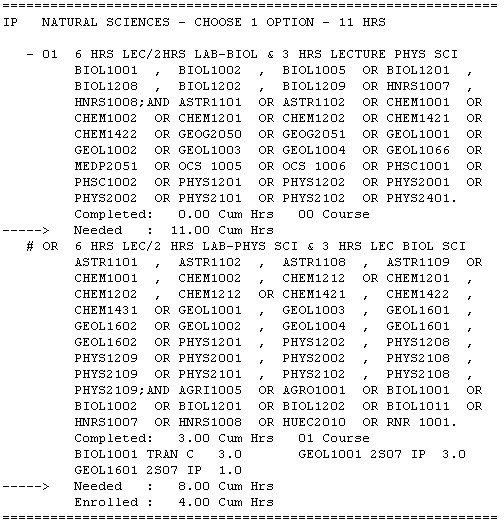 According to the bars shown, the natural sciences requirement and the subrequirements are incomplete or in progress (the red bar and the lighter red bars). The sub-requirement in progress reads "enrolled" and is characterized by a yellow bar. Below the subrequirement, there is a list of classes that are in progress (IP), or that have been taken (shown as the grade received in the class already taken). The first symbol (IP) signifies that this particular requirement is currently in progress. The symbol (-) signifies that the sub-requirement is incomplete. The symbol (#) that precedes the second sub-requirement list signifies that the subrequirement is in progress. Below the sub-requirement is a list of classes attempted, grades received, and the semester the class was taken.